Pennsauken, NJ, March 19, 2019… NewTek Sensor Solutions expanded the capabilities of its DC LVDT technology with 4-20mA output capabilities to meet the needs of industrial monitoring and feedback applications. In addition to offering 4-20 mA versions of its free-core and spring-loaded LVDTs, the company customizes 4-20mA position sensors to customer specifications. 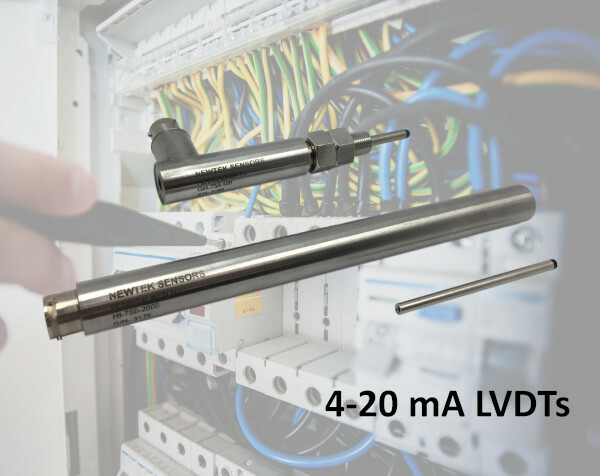 Offering the frictionless operation and high resolution associated with LVDT technology, the 4-20 mA sensors offer high resolutions with a standard 0.25% and optional 0.1% maximum non-linearity . Operating from 11 –28 VDC, the DC-operated linear position sensors are available in full ranges from 0.10” (2.5 mm) to 20” (500 mm). NewTek offers its 4-20mA output sensors with built-in surge and polarity protection to guard against voltage spikes and hookup errors. Refer to the website at https://www.newteksensors.com/products/#4-20 view standard 4-20 mA free-core, spring-loaded, and custom LVDTs, or contact Mike Marciante at 856-406-6877 to discuss your application requirements.